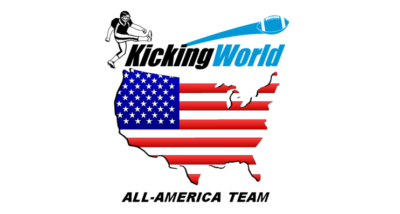 The 2014 Kicking World Invite-Only Showcase brought 42 of the country’s best prep kickers & punters from 16 states to beautiful Santee, CA (15 minutes east of downtown San Diego) on Saturday & Sunday, December 6-7, 2014. Kicking World’s top specialists were hand-picked by Coach Brent and the staff and out of the close to 900 students we trained in 2014, only 105 were invited to this prestigious event. 42 students made the trek out to San Diego (8 more were expected, but had state playoff games and unable to attend). Showcase participants squared off for a weekend of fun but intense elimination competitions, charting, classroom instruction and mental training to help legitimize their kicking and punting ability. The Event helped kicking recruits showcase their abilities to college football programs. College football coaches were in attendance in person as well as several dozens of college football coaches streamed the Showcase Event live on YouTube, as did thousands of other families, friends & Kicking World fans. View all the Showcase Facebook Photos here and Watch the live 2014 Showcase Replay on YouTube. The weekend was a major success and already several Showcase attendees have received increased interest from college football programs due to their exceptional performances at the event. Next year’s Kicking World Invite-Only Showcase Event will again take place in early December and all Kicking World campers will have the opportunity to qualify for an invitation based on their performance at any 2015 Kicking World Camps.